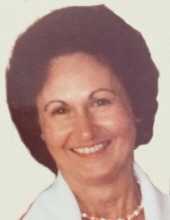 Gloria DeCirce, 91, of Geddes, passed away Tuesday, April 2, 2019 at The Centers at St. Camillus. A lifetime resident of Syracuse, she was a communicant of Holy Family Church. Gloria volunteered at St. Joseph’s Hospital and St. Camillus. An avid SU and Yankees fan, she also enjoyed traveling and cooking. Gloria loved spending time with family, especially her grandchildren. Gloria was predeceased by her husband, Michael N. DeCirce, in 1977. Surviving are her daughter, Karen (Terry) Engels of Baldwinsville; sons, Michael of Liverpool, Dave (Martha) of Buffalo and Gregory (Sharon) of Syracuse; brothers, Donald Martino of Auburn and Dr. Joseph (Doris) Martino of Pultneyville; grandchildren, Elisabeth, Matthew, Mark, Ali (Will), Julia, David, Michael, Gregory, Terry, Nicholas and Daniel; great-granddaughter, Juliet; and a niece and nephew. A funeral Mass will be celebrated Friday, April 12 at 10 a.m. in Holy Family Church, 127 Chapel Dr., Syracuse. Gloria will be laid to rest in Assumption Cemetery, Syracuse. In lieu of flowers, contributions may be made to the St. Camillus Foundation, 813 Fay Rd., Syracuse, NY 13219. To send flowers or a remembrance gift to the family of Gloria DeCirce, please visit our Tribute Store. "Email Address" would like to share the life celebration of Gloria DeCirce. Click on the "link" to go to share a favorite memory or leave a condolence message for the family.